I did a lot of baking over the weekend. It made me realize that I have yet to share any of my favorites recipes with you, which is silly because I love to cook and I’ve got some tasty recipes over here. Recipes that want to be shared. Like these muffins. They are easy and just a little bit sweet. (Coincidentally, just how I like my men…wink wink!) 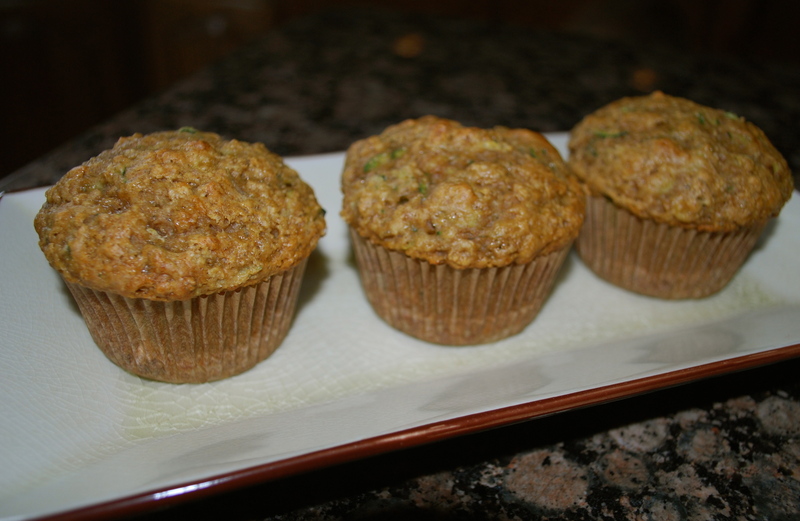 Seriously though, they are a cinch to throw together and make a great breakfast or snack and the fact that they include zucchini is a bonus in the height of zucchini season. A couple of notes before we get started: this recipe is adapted from a Martha Stewart recipe. I cut the sugar way down, it’s a muffin – not a cupcake – for goodness sake. Also, I upped the banana a bit and I feel like that really helped to keep the muffins nice and moist. The result is a light, flavorful muffin that will hit the spot whether you slather it with cream cheese at brunch or just nibble on it plain while you brainstorm about tonight’s dinner menu and field questions about Lightning McQueen. Preheat oven to 350 degrees. Prep 12 standard muffin cups with cooking spray or paper liners. In a large bowl, whisk together dry ingredients: flour, flax meal, brown sugar, baking soda, baking powder, salt and cinnamon. Add banana and zucchini and stir to combine. In a small bowl, whisk together wet ingredients: milk, egg and vanilla. Add milk mixture to flour and mixture and stir until combined. Be careful not to over mix. Divide batter among 12 muffin cups, the cups will be about 3/4 full. Bake 20-25 minutes or until golden brown and a toothpick inserted in the center comes out clean. Let muffins cool completely in pan on a wire rack. Or just eat them. I’m not the boss of you. Do what you want. By the way, these freeze nicely. So you can make a batch and keep the leftovers in the freezer for another day if you like.